Bob Brozman is one of those rare artists whose exceptional wit, music, energy and depth of knowledge combine powerfully to create an unforgettable, truly live concert. A master of blues, slide, hot jazz, Hawaiian and Caribbean guitar styles, Bob has a fast-paced, wide-ranging show that keeps audiences worldwide on the edge of their seats laughing, marveling, and participating in his infectious rhythms. The human personification of the word �eclectic�, Bob Brozman is unrivaled in the diversity of his musical interests and cross-cultural mastery. A musicologist and historian, musical adventurer and explorer, internationalist, slide-guitar virtuoso, and then some - Brozman does all that and he does it well � really well. Indeed, this guy is a giant. When National Guitar reformed in the early 1990�s I spoke to one of the owners, McGregor. He told me then, �if one guy in the whole world exemplifies the National Guitar today it is Bob Brozman�. That�s a hefty accolade considering that there were a few National players around. They are still around but Brozman can teach them all a thing or two. When it comes to the slide guitar, be it lap steel or bottleneck - be it the history of the National guitar, the mastery of diverse styles: Hawaiian kiki-kila, Hula blues, Indian, American blues, etc., nobody can touch him. Nobody knows more tunings, more styles and more techniques than Bob Brozman. He is truly a remarkable musician and musicologist, a true cultural treasure, a walking encyclopedia of the steel guitar. It does not matter which way he holds the guitar, he is a sorcerer and a supreme master. His mainstay is the novel mixing of American and world music styles in completely new ways, as his slide guitar explores the musical frontiers between the first and third worlds. Throughout, Bob maintains a disarming talent for humor - from the zany to the sardonic. Includes turnarounds, bottleneck techniques, blue notes, open G tuning, right hand techniques, blues licks and phrases, authentic blues rhythms, harmonics and more. Includes transcriptions of "Terraplane Blues, Moon Goin Down, and Rhythm in the Blues". Bob Brozman Plays "Down The Road"
While they slowly illustrate classic country blues guitar duets in the styles of Big Bill Broonzy, Blind Blake and Lonnie Johnson - Woody Mann and Bob Brozman explore the techniques and thinking that go into creating cohesive duet guitar parts that compliment each other. Each part is taught separately. They explain and illustrate how you can arrange a simple song through the use of new chord positions, simple picking syncopation ideas and open tunings as well as walking you through the basics of how to select a key, use of a capo and listening to the song in new ways. The duo presents effective techniques for improving improvisational skills while jamming with other musicians. Each guitar part is a solo tune in itself. The ideas and techniques covered in this video offer creative approaches to expanding all aspects of your playing. Titles include: "Lazy Blues, Tampa Slow Grind, Mr. Blake, Long Gone Blues, Tab Guitar Rag". In this unique video lesson, Bob Brozman and Woody Mann describe and teach in detail duet arrangements in the styles of the great Delta blues guitarists: Charlie Patton, Robert Johnson, Willie Brown, Tommy Johnson and Son House. Techniques and ideas for creating a cohesive guitar part that compliments, rather than competes or conflicts, are discussed. Each part is taught separately and presented in tablature and music notation. Woody and Bob also present effective techniques for improving improvisation skills while jamming with other musicians. The tunes presented in this lesson can be used as repertoire pieces for either solo or duet situations. All in all, a very unique instructional video giving you twice the amount of ideas and challenges from two of today's blues guitar masters. Titles include: "Banty Rooster, Moon Goin' Down, Bye Bye Blues, Robert Johnson's Blues, Big Road Blues". Blues, Ragtime & Swing. Move beyond basic folk styles and get into the excitement of fingerstyle blues, ragtime and swing! With his dynamic picking techniques and deep understanding of traditional guitar styles, Bob Brozman provides you with the tools to explore your guitar's rhythmic, harmonic and melodic possibilities. Bob shows you how to play exciting songs like "Salty Dog Blues, Jazz'm Blues" and "Sister Kate". Learning these pieces will increase your knowledge of chord voicings and inversions up and down the fingerboard. As you reach automatically for the position you need, you'll learn how to connect the chord you are playing with other chords in a song's progression and you'll also gain an understanding of music theory as well. Bob also covers ragtime picking patterns, compression strokes, two-hand string damping, harmonics, double-time rhythm and other exciting right-hand techniques! Blues, Ragtime & Swing. This jam-packed lesson will build your instrumental skills, improve your fingerpicking and help enhance your total understanding of the guitar fingerboard. Bob's breakdown of his powerful fingerstyle and chording techniques is designed to move you beyond basic folk styles into more complex musical forms that are deeply within the American popular tradition. He teaches the important 32-bar song form, along with the distinctive chords and rhythms that characterize swing, Gypsy jazz, '30s Cab Calloway-style songs, calypso rhythms and other "hot guitar" sounds! He shows you how to use palm harmonics, play minor key jazz/blues tunes and provides you with a variety of rhythm exercises so you can play those "fat" swing chords that everybody loves. You'll then put all these newfound skills into practice as you learn note-for-note renditions of "Hot Moments With You Dear, Blue Devil Blues, Dog & Cat". In this video, the powerful blues of the Mississippi Delta, as developed by legendary players like Robert Johnson, Charlie Patton and Bukka White, is taught to you in remarkable detail by a true master of the form. Bob Brozman begins with the basics, teaching the open tunings needed to get the typical bottleneck sound. Through careful explanations of left and right-hand technique, exercises and songs, this video unveils the secrets of traditional blues/slide guitar. Beginning and experienced slide players alike will benefit from his detailed instruction teaching powerful licks and runs, rhythm techniques, vibrato, harmonics and other ways to get the true Delta sound. Before you know it, you'll be playing dynamic tunes like "Can't Be Satisfied" by Muddy Waters. Expand your blues repertoire and master a breathtaking variety of licks and techniques! Bob Brozman's complete blues toolbox will teach you the styles, innovations and techniques created by the Delta Slide masters. Robert Johnson's powerful one-chord version of "Come On In My Kitchen" becomes a real showpiece as Bob shows you how to add chords "Scrunch" strokes, damping, palm harmonics, vibrato, slides, trills and other techniques. His Up-tempo medley "Delta Memories" highlights the chopped rhythms, descending bass lines, string snapping, rolling triplets, barre technique and turnarounds favored by these early Delta innovators. Bob then features his own percussive slapping techniques and variations to give you a real workout! Pulling out all the stops, Bob teaches "Rollin' and Tumblin" by Charlie Patton which is brimming with material to challenge more advanced guitarists. This lesson provides an abundance of slide technique, new ideas and amazing guitar applications! Add eight powerful tunes to your blues repertoire and develop depth and range in your bottleneck playing! As in his previous lessons, Bob Brozman shows in detail what you have to do to get an authentic blues sound, demonstrating the rhythmic power of Bukka White, the chant-like tonality of Skip James, the clean tone and string damping style of Tampa Red, and the raw power of the great pioneer Charlie Patton. Working in a variety of major and minor open tunings, Bob covers swing and "train-time" licks, finger sliding & vibrato, modal chords, rhythmic variations & a variety of triplets, harmonic devices, string snapping, funky ghost notes, descending bass lines and other important techniques. You'll even learn slide in standard tuning &get to play Bukka White's spectacular "spank the baby" routine. Tunes include: "Aberdeen, Jitterbug Swing, Old Dog Blues, Mississippi, Denver Blues, Cypress Grove, Telegram Blues, Green River Blues, Pony Blues". A fascinating lesson for acoustic guitarists who want to know more about building rhythmic elements into their accompaniment and lead playing. Bob explores many aspects of rhythm guitar, investigating the elements of meter and what makes a good "groove". He helps you develop your coordination through a variety of drills; hand and foot-tapping exercises so that accents, swing rhythm, poly-rhythms, triplets in blues playing become second nature. You'll learn how to use these techniques in songs using strumming patterns, string slapping, fret tapping, hammering, damping, and other devices. Bob works all of these into his blues, Caribbean and ragtime picking. This course in lap style slide guitar will open up exciting musical ideas and powerful techniques for anyone who wants to get into the real blues sound. Playing in open D and open G tunings, Bob passes along all the sounds and techniques that make up this compelling style. 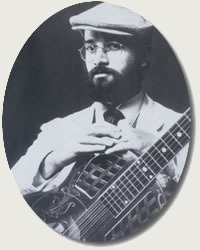 He teaches pieces that range from the "primitive" one-chord renditions of Charlie Patton to modern-day country/swing blues. You'll get instruction in the use of the round-nose bar and how you can attain quality vibrato, pitch precision, good tone, blue notes, rhythmic effects and control of the slide. Bob details licks, turnarounds and improvisations along with numerous exercises and right hand picking drills to help you develop your picking strength. By the time you complete this lesson, you'll have an arsenal of licks and the improvisational skills you'll need to go on to even more challenging material! Bob Brozman takes lap blues playing to the next level! Starting off in G tuning (you'll also learn open C and D Minor), Bob concentrates on the deep blues "Delta Notes". He runs through 'sharpening' exercises using bar hammer-ons combined with open strings and alternate pick strokes, drills designed to help you get your rhythm together and practice jumps & slides to allow you to play faster without sacrificing tone. Bob explores the blues classic "Rolling and Tumbling" - starting with a stripped down version and then taking it to increasingly more challenging levels. You'll learn numerous turnarounds and get plenty of play-along examples for great practice sessions. More advanced moves follow as you learn how to maintain a steady bass groove while keeping country swing blues rhythm and melody going. You'll employ two-hand damping to get staccato chords to contract with melody notes, harmonics, sweep picking, raking and other special effects. From low-down Delta to sweet New Orleans blues, this course will have you playing it all! Add a touch of the islands to your guitar playing! Calypso's wild pulses, danceable rhythms and playful lyrics will spice up all your arrangements and inspire you to develop your own tropical repertoire. Syncopation is the key to this distinctive approach to traditional folk-based world music. Bob Brozman shows you how to use fingerpicking and strumming patterns to suit the emotional content of these story-songs. Working in a variety of keys he details all the elements of the single-tone and double-tone forms plus a variety of tempos, including calypso, tango, samba, waltz, mazurka and Latin-jazz. Bob presents the following techniques and an array of substitutions and variations: "moving bass lines, chords and voicings, percussive strokes, licks, arpeggios, octave runs and triplets. Songs include: "Uncle Joe, Down the Road, Death Calypso, Poor But Ambitious, Cinemascope Calypso, It Happened In Monterey, The Five Year Plan". Bob Brozman's lesson in traditional Hawaiian guitar will open up new horizons and wide sonic possibilities for guitarists as well as Dobro, lap steel and pedal steel players. With Bob's thorough teaching style, you'll learn bar technique, Hawaiian tunings, hand positions, scale positions, harmonies, vibrato, and harmonic "chimes". He shows many different ways to use turnarounds and builds each tune from its basic form to a complex highly embellished showpiece. Split-screen close-ups help Bob to illustrate the importance of string pairs, slants with the bar, playing thirds, and fifths of each chord, the use of palm harmonics and more. Brozman is one of those rare artists whose exceptional wit, music, energy and depth of knowledge combine powerfully to create an unforgettable, truly live concert. A master of blues, slide, hot jazz, Hawaiian and Caribbean guitar styles, Bob has a fast-paced, wide-ranging show that keeps audiences worldwide on the edge of their seats laughing, marveling and participating in his infectious rhythms. His mainstay is the novel mixing of American and world music styles in completely new ways, as his slide guitar explores the musical frontiers between the first and third worlds. Throughout, Bob maintains a disarming talent for humor, from the zany to the sardonic. This 90 minute DVD concert was recorded at the Freight & Salvage, Berkeley California. Titles include: "Zonky, Highway 49 Blues, Down the Road, Phonograph Blues, Hawaiian Medley, La Vie en Rose, Ukulele Spaghetti, Love in Vain, Telegram Blues, Old Dog Blues, Green River Blues, Backwards Blues, Minnie the Moocher, Cinemascope Calypso, Dinah, Meleana E, Come On In My Kitchen, Train Song". Bob Brozman Plays "Highway 49 Blues"